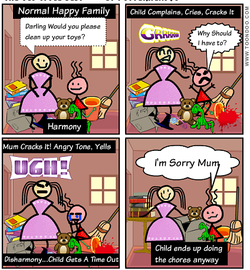 In this comic, you will notice a child and a mother/carer asking the child to complete a basic everyday chore. When the child reacts in the wrong way they end up getting a time out... The child ends up completing the chore anyway. This is how the 'Old Cycle' pans out. In the comic, the same occurs. 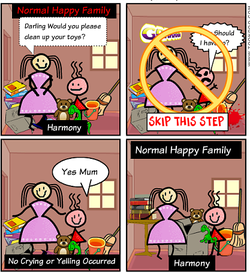 A mother/Carer asks the child to complete a chore of the everyday kind. The child then skips the step of the reacting badly and goes on to complete their task. This keeps harmony within the household and harmony within the relationship between you and your child. This is how the 'New Cycle' pans out. You can download this clip to show your child how they can have success at "skipping the middle bit" and keeping the harmony! They might like to hang this up on their bedroom door or fridge as a reminder of how simple it is to keep the harmony. It's really only one step! Forget the 'Old Cycle' and embrace the 'New Cycle'.